Botox is the fastest and easiest way to remove unwanted wrinkles, we have the most affordable treatments for Botox that Boston has to offer. Rates start at £160 for 1 area, two areas £220 and for three areas £320 and for for Botox under arm£480. Botox is the preferred non-surgical way to remove lines and is the least invasive. Botulinum toxin, when used with local injection, has demonstrated to produce powerful results in the treatment of increased tonicity in both skeletal and smoothen muscle as well as illness that may be presented with increased secretion from glands. From procedures that can be carried out in Boston Dental Centre, after local injection, the Botulinum Toxin helps to lessen muscle tone competently for a few months and diminishes secretion from sweat, lacrimal and salivary glands. For determination of the dosage the biological activity of the Serotype is determining factor. This is Determined using a mouse lethal assay and is designated in biological units ( so-called mouse units : MU) One MU corresponds to the amount of toxin needed to kill half of population of treated mice injected intraperitoneally with toxin. In addition it is indicated in clinical manifestation of intense progressive primary hyperhydrosis of axilla where patients are severely hampered in their daily routine and cannot be adequately controlled by topical treatments. In analogy to its proven efficacy in the treatment of arm and hand spasticity as a result of stroke or pes equines following infantile spastic paralysis the positive effect of botulinum toxin in the treatment of arm and hand spasticity of different origins as well as leg spastic not connected with infantile spastic paralysis can be assumed . Other causes for these maladies include cranial trauma encephalitis (multiple sclerosis) brain tumor or injury and illness of brain and spinal cord . Botulinum toxin has been proven and tested in two clinical indications in urology: in increased sphincter contraction or detrusor sphincter dyssynergia and in hyperactive bladder. Botoxand Dysport smooth wrinkles that are caused by nerves and muscles under the skin. Nerve cells release a chemical (acetylcholine) that contracts the muscle of the face. 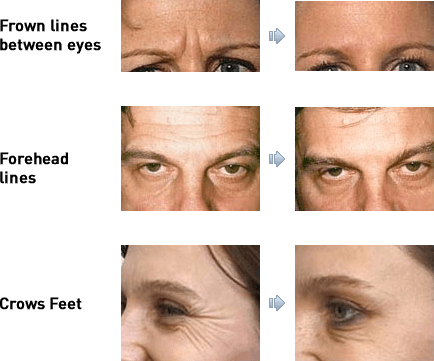 Over time this repeated contraction causes “expression lines”, also called wrinkles. Injections of Botox or Dysport interrupt the release of acetylcholine, and these stop those areas from contracting into expression lines and wrinkles. The age of the typical Surrey patient spans 35 through 60. Botox usually reduces wrinkles by 80% — that’s quite a lot. Results of treatments are temporary, so plan for additional injections. Dr Silvia Botox provider in BDC will help you tailor a plan to your specific long-term goals. The treatment is performed in our Clinic usually without any anesthesia, but a topical numbing cream is often used. Patients experience relatively minor discomfort from the injections which last from a few minutes to about 20 minutes for an extensive treatment. Patients are free to drive home shortly after the procedure is completed. After one full treatment, the effects are fully visible in 7 days, and the effect lingers for a minimum of three months and typically up to five months. Results do vary from patient to patient. Also, after repeated treatments, the effect tends to be sustained even longer. Botox treatment is simple: it is a highly purified type of protein that is carefully injected into your muscles to strengthen and smooth lines. Only a trained professional is allowed to administer as Botox is a controlled prescription drug. Boston Dental Centre is recognized as a respectable cosmetic dentistry with trained expert practitioners providing safe procedures for Boston Dental Centre has to offer. If you would like to speak to one of our professional consultants for impartial advice on Botox, please do not hesitate to contact us. Botox® has now been formally approved for cosmetic use under a new name, Vistabel®. We are pleased to confirm that only Botox® / Vistabel® will be used in our practice and that it will only be administered by physicians who have been fully trained in its use. Botox® and Vistabel® contain exactly the same tried and tested formulation from the same manufacturer (Allergen). Botox® treatments include wrinkle relaxing injections (the treatment we all know as Botox®). It is a very popular treatment for deep wrinkles.